I originally found this recipe in Family Circle magazine. It looked pretty simple and straightforward (not to mention tasty) so I thought I'd give it a whirl. Once I started in on this recipe, I discovered that what had seemed simple initially was actually a train wreck of confusing ingredient amounts/sizes, ambiguous directions and my own inability to properly fold a burrito. But fear not! What could have proven to be an epic fail on my part was salvaged into an edible and even scrumptious meal once I made several adjustments to the original recipe. The only remaining issue was the singed fingers due to my lack of burrito folding skills and general clumsiness when it come to hot skillets. Some of the adjustments I made included reducing the heat of the pan from medium-high to medium (though I imagine that this will vary from stove to stove), determining the actual amount of rice needed, and determining the size and increasing the number of tortillas needed. The number of tortillas you need depends on your burrito folding prowess and how full you actually stuff them. 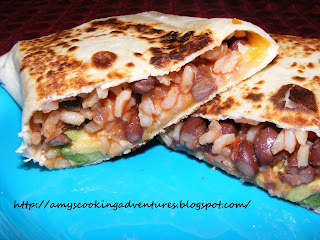 I have added burrito folding tips in the recipe. I looked these up after I was done cooking--who knew there was a "right" way to fold a burrito! The original recipe called for 6 tortillas, I think there is enough filling to make up to 8 small burritos. Mix rice, salsa, and beans together in a medium sized bowl, set aside. Combine avocado and lime juice in a small bowl, set aside. Lay out tortillas. Place fillings in a line across the tortilla. Place cheese first followed by approximately 1/2 cup of the rice mixture and a spoonful of avocados. Fold the burritos by folding in a long side first, followed by both short sides, then rolling the burrito over the final long side, and letting it rest on the fold. Heat a large non stick skillet over medium heat. Coat both sides of the burrito with cooking spray and place seam side down in the skillet. Cook 1-2 minutes or until the tortilla is lightly browned and crispy. Flip and brown the other side. Repeat with the remaining burritos, reducing heat if they brown too quickly. Enjoy! Amy, I'm soooo hungry! This sound fantastic right about now! :) I love all the fun tips you are sharing on your blog, btw. Thanks!